April | 2013 | Saviour Builders Pvt. Ltd. 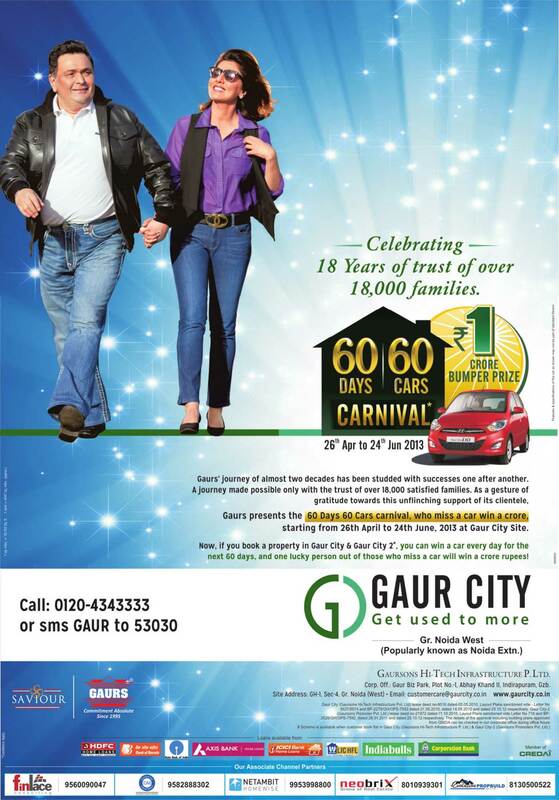 If you book a property in Gaur City and Gaur City 2, you can win a car everyday for the next 60 days, and one lucky person out of those who miss a car will win crore rupees..!! 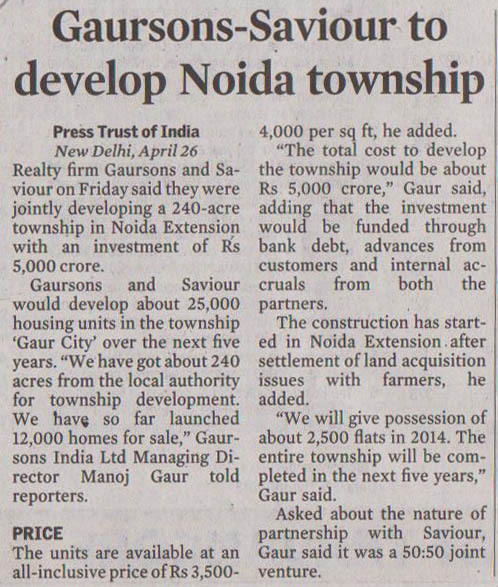 Starting from 26th April to 24th June, 2013 at Gaur City Site Greater Noida West (Popularly known as Noida Extension). The finance ministry on Friday said that the government is probing 18 real estate firms across the country for alleged forgeries and running dubious investment schemes. In a written reply to a question in Lok Sabha, minister of state for finance Namo Narain Meena gave out the details of the companies against which the government had received complained and taken action for committing various forgeries and launching wrong/dubious investment schemes. Ten of these companies had received a clean chit from the SEBI that they were not running collective investment schemes. The stock market watchdog was still examining complaints against seven entities while it had found prima facie that two companies were running collective investment scheme and was in the process of taking suitable action against them. These two companies are Ecogreen Real Estate India Ltd and Ken Infratech Ltd. Sukhchain Singh, managing director of Delhi-registered Ken Infratech, said his company did not run any collective investment scheme. We have not got any letter from the government enquiring from us, he said. 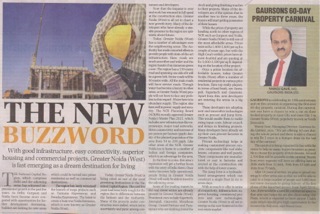 Different agencies have already initiated action against another eight companies — Alchemist Infra Reality Ltd, PACL Ltd, KBCL India Ltd, SGS Agro Farm Ltd, RBN Real Estate and Allied India, Maitreya Plotters and Structurals Pvt Ltd, Megacity Bangalore Developers and Builders Pvt Ltd and Sai Prasad Properties Ltd. In the case of Jain Housing and Constructions Hyderabad Ltd the company’s reply is awaited. Sebi is still examining complaints against Nicer Green Housing, Imbowers Housing and Infrastructure Ltd, IHI Developers India Ltd, Servehit Housing and Infrastructure Ltd,Taneja Developers and Infrastructure (Panipat) Ltd, Royal Infra Towers Ltd and Maxworth Buildtech Ltd. In the case of Alchemist Infra Reality Ltd the Delhi High Court has granted an interim stay against investigation ordered by the finance ministry.